Petroleum products, water or any other liquid being transported through pipes is designed to be contained, and any breach (leak, rupture) has the potential to be detrimental to the contents of a room, one or more floors of a building, the environment or all of the above. However, leaks are often inevitable – even with the proper design, construction, and installation of piping systems. Noting this, it’s critical to react quickly when there is a leak, swiftly identify the source, and mitigate the damage. That’s the primary benefit of the PermAlert Leak Detection System. PermAlert works by monitoring cables and probes to quickly detect leaks in a piping system. When leaks are detected, an alert sounds and operators are directed to the area that’s in question to make the necessary repairs, response or adjustments. 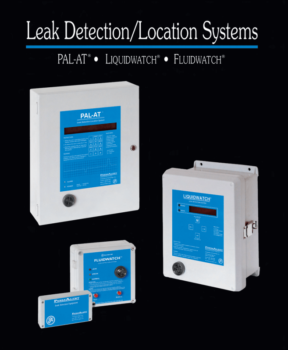 PAL-AT is an advanced microprocessor-based leak detection cable system that sounds an alarm on contact with liquids. It locates potential problems anywhere along the sensing cable. FLUIDWATCH® systems monitor small areas for water or water-based chemicals on floors and around equipment. Common applications include sub floors and around boilers and pumps. The system operates on 120/240 VAC or 24 VDC. It was created to be versatile and very easy to operate. FLUIDWATCH II uses a smaller panel so the panel can be remotely monitored when the placement is not easily accessible to the user. It operates on 10V – 30 V AC/DC. LIQUIDWATCH® satisfies a broad range of leak monitoring needs. This system can be configured with up to 64 probes and 16-alarm relays. It is a UL, Class 1, Division 1, Groups C & D system. The design allows you to satisfy existing needs and easily adapts for future expansion. The system has a 2-line, 20-character display that provides instant system information. Probes can be programmed on a leak alarm to operate 1 of 16 optional relays for remote alarm indication or operation of a shut down procedure. The system is very easy to use and includes one keypad for operation. In addition to PermAlert Leak Detection Systems, our experts at TEC also specialize in Perma-Pipe installation. Perma-Pipe is pre-insulated piping designed for installation in a variety of facilities where water or petroleum leaks have the potential to cause a significant loss of property or data at a high cost. TEC is an authorized distributor and certified installer of Perma-Pipe and PermAlert leak detection systems, performing such installations at data centers, government facilities and various commercial entities. No matter what your piping system requires, we will help ensure you don’t suffer unnecessary damages from leaks that could have been quickly detected and mitigated. For more information or to get started with your leak protection system, contact us online or find our office near you.